Lake County takes its name from its many lakes, most prominently Clear Lake, which is one of the largest natural freshwater lakes in California and a popular destination for water skiing, bass fishing and kayaking. Estimated at 2.5 million years old, Clear Lake is thought to be one of the oldest lakes in North America. 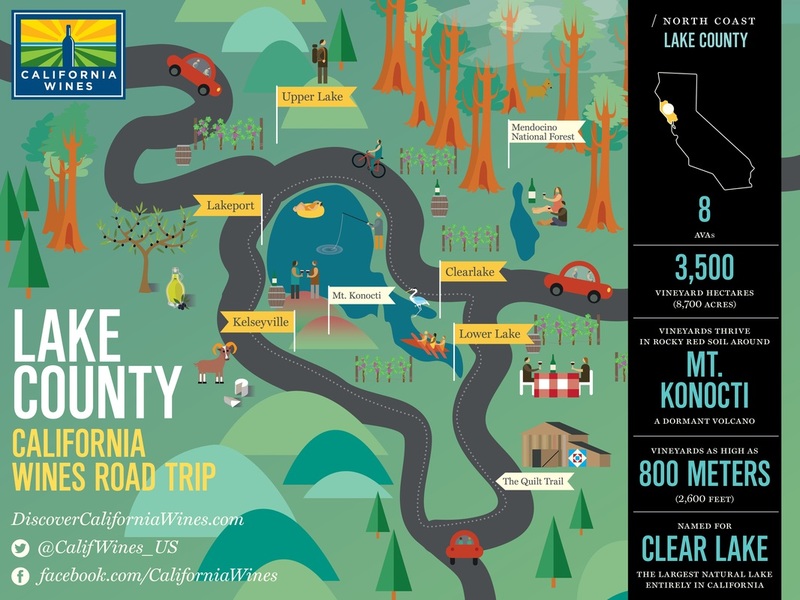 Located midway between the Pacific Coast and California’s Inland Valleys in the state’s coastal mountain range, Lake County’s 8,700 acres (3,520 hectares) of vineyards are 1,370-2,600 feet (418-792 meters) above sea level. These dramatic high-elevation vineyards receive approximately 265 days of bright sunny days and cool afternoon breezes, making the region ideal for winegrowing and outdoor recreation. SIP: Lake County is home to more than 30 wineries and 160 growers. Browse this list of Lake County wineries or printable map. Or use the Discover Lake County Wine interactive map to search wineries by amenities such as tours, gardens, picnic areas, food for purchase and more. A few starters: with four tasting rooms on Main Street, the town of Kelseyville offers a fun, leisurely way to enjoy an afternoon of wine tasting. And there are about a dozen wineries to discover in and near the volcanic hillsides of the Red Hills American Viticultural Area along with spectacular views of Mt. Konocti, a dormant towering volcano. STAY: Lake County’s charming accommodation options include small inns and hotels, lakeside cottages, winery properties and even vintage railroad cabooses. For more information visit Lake County wineries or lakecounty.com. PLAY: Chocolate lovers should check out Wine & Chocolate, usually the first weekend in February. This charity fundraiser for the Lake County Family Resource Center features Lake County wineries pouring their fabulous wines under one roof as well as wine and olive oil sensory classes. Another great time to visit Lake County is during the Lake County Wine Adventure, usually held the third weekend of May. The Gala kick-off on Friday evening is followed by a two-day passport adventure with 25-plus wineries offering wine, food pairings, music and fun. Outdoor enthusiasts will find much to do in Lake County. A hiker’s paradise, it offers 100 miles of trails to explore including Mt. Konocti County Park, part of the Mendocino National Forest and many more. Fishing, camping and birding are also popular pursuits here. Clear Lake was designated as an Important Bird Area by the Audubon Society long ago because it serves as a vital resting spot for migrating birds on the Pacific Flyway. Take an Eyes of the Wild pontoon boat tour or join the Heron Days boat tours this spring (usually April or May), where the local Audubon Society points out Great Blue Herons and other amazing avians. Biking is also big here, boasting 11 Konocti Trails. MAKE: Crafty types can draw inspiration visiting California's first Quilt Trail, featuring 79 painted quilt squares on highly visible barns and buildings throughout Lake County. 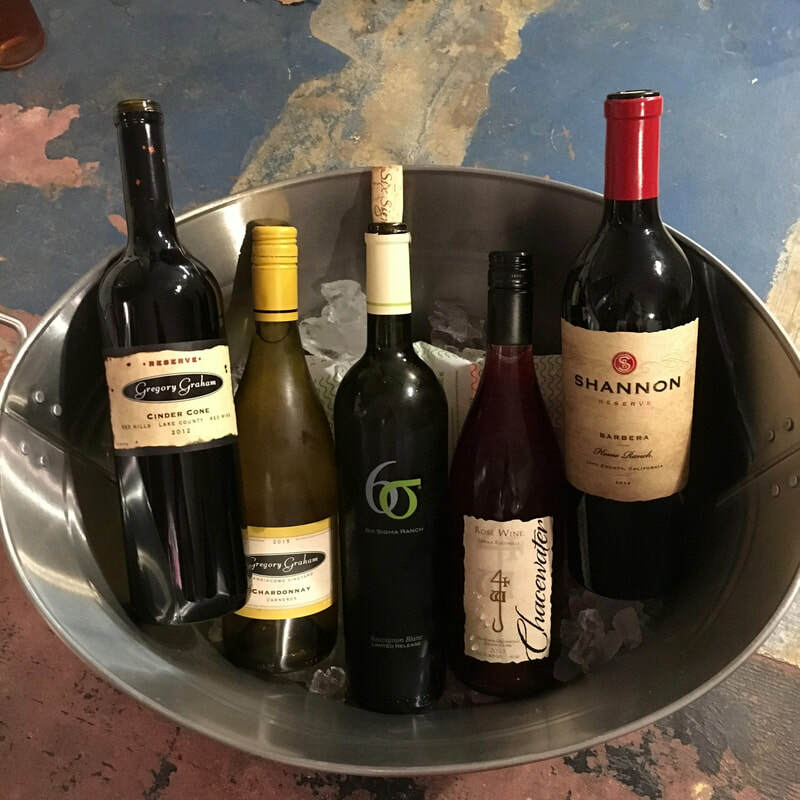 Enjoy local wines while learning to paint with oil or join the fun at a Wineglass Painting Party, just a few of the events offered at the Lake County Wine Studio. GROW: Lake County is a thriving agricultural area with wine grapes, pears and walnuts as the three main crops. Most known for Cabernet Sauvignon and Sauvignon Blanc, the region’s moderate climate allows a diverse range of other grape varieties to thrive here including Zinfandel, Petite Sirah, Chardonnay, Malbec, Barbera and Syrah. Sustainable wine growing efforts are central to Lake County’s approach. To support and enhance Lake County vineyards, the Lake County Winegrape Commission has two programs to assist growers. The Master Vigneron Program (MVP) provides education and training to vineyard managers and foremen in leading industry viticultural practices and leadership. Growers and vintners also participate in the California Sustainable Winegrowing Programto adopt best practices for high wine and grape quality that benefit the environment and community. EAT: Where winegrapes grow, olives are often found nearby. Lake County is gaining a reputation for award-winning olive oils. Discover the products of The Villa Barone, located on a 160-acre ranch that also offers weekend immersion experiences. Or enjoy olive oil samples, wine tasting, hula hooping and even an olive pit spitting contest at the Kelseyville Olive Festival in April. In 2015, Lake County produced 40 percent of the pears that were sold on the fresh market in California. Taste why they are so popular at the Kelseyville Pear Festival, held the last Saturday of September. For artisanal goat cheese, visit the Bodega & Yerba Santa Goat Dairy in Lakeport for a farm tour and tasting; phone ahead for a reservation at 707/263-8131. Visit Discover California Wines for information on wine regions, wines and wineries throughout the Golden State and for planning a trip to California wine country. California is the number one U.S. state for wine and food tourism with dozens of distinct wine regions, 136 American Viticultural Areas and 4,400 wineries that produce 85 percent of U.S. wine. Established in 1934, Wine Institute is the public policy association of nearly 1,000 California wineries. See: Wine Institute for more.